It was so timely and proper that the so called Heroes of the 21st Century the OFW’s should learned how to use their resources right and be aware of their vulnerability to loose their hard earned income after which they retired from their works. On its second year, the OFW and Family Summit of the Villar Foundation and GoNegosyo once again attracted record number of participants. 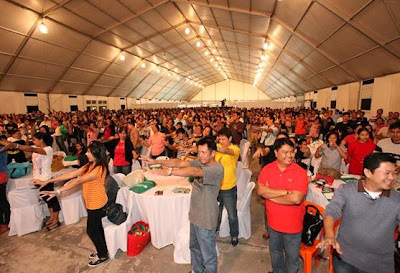 Overseas Filipino workers (OFW) returnees as well as their families once again trooped to the World Trade Center in Pasay City in full force for the one-day summit on November 22. Senator Manny Villar and Cynthia Villar—Chairman and Managing Director, respectively, of the Villar Foundation— joined by a representative of Pasay City Mayor Antonio Calixto, GoNegosyo’s founding trustee Joey Conception and Executive Director Ramon Lopez led the ribbon-cutting ceremony. Concepcion and Mrs. Villar led the lineup of speakers and resource persons. The Former Las Pinas Representative emphasized the important role and contribution of OFWs in the country in her speech as she encouraged OFWs and their beneficiaries to handle their salaries and the remittances they receive very well by looking for business opportunities. “We want to remind OFWs and help their families understand that handling their finances or salaries well is very important, so whatever they have worked hard for will not go to waste. It is even better if they can make their earnings from abroad grow through proper investment such as venturing into a business of their own” cited Mrs. Villar, now fondly called Misis Hanep Buhay because of all the livelihood projects she started with the Villar Foundation. The OFWs sat down and listened attentively to all the speakers and resource persons invited for the event, each of whom gave not only tips and information but also encouragement and inspiration to OFWs about starting their own businesses, overcoming challenges and even about life in general. 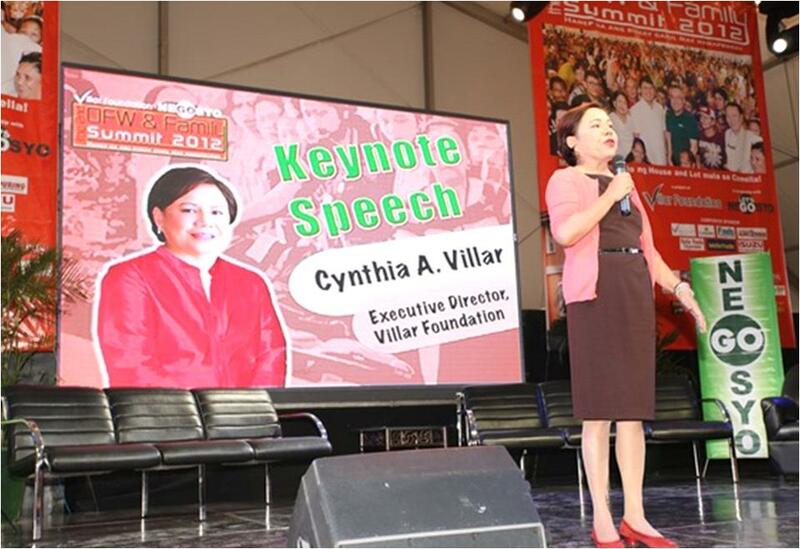 “Tagumpay Forum”, which delves on the challenges and triumphs by OFWs turned entrepreneurs, who have persevered, passionately believing they can succeed, was among the highlights of the event. Former OFWs Mike Casas, Annie Sitjar and Cherry Yack shared their experiences and the challenges they faced before becoming successful in their chosen businesses. Casas has embarked on bottled sardines while Sitjar and Yack ventured into a poultry business. “Starting small, they’re now making good money while enjoying life with their loved ones in the country. And so, there’s no need for them to work abroad, and this is what the Villar Foundation together with GoNegosyo have been espousing, giving our OFWs and their families an option to earn a living,” noted Villar. And many more lives were changed and blessed that Thurday with the raffle prizes that were given away. These are no ordinary prizes, most of which are livelihood packages, so the winners can start their own small business right away after the event. These include motorcycle units that can be converted into tricycles from Motortrade; sari-sari stores packages from Aling Puring of Puregold and Finds Convenience Store, Kettle Corn franchise from RFM Corp., items from Markina Shoe Expo; SIM cards from Smart; dealership/membership kits from Fern-C; and of course, the much-awaited brand new house and lot from Camella Homes. 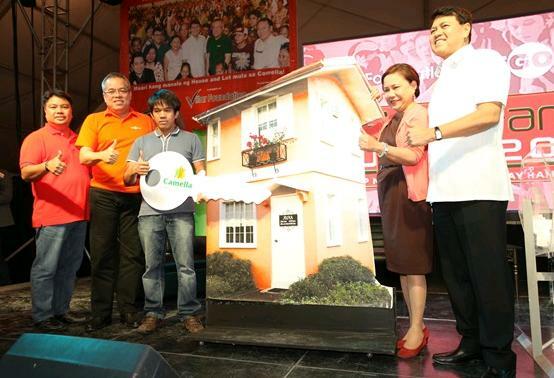 Russel Nalayog, a seaman from Greece, was the very lucky winner of the house and lot. He could not contain his happiness and gratitude for the Villar family for the huge blessing he received. Last year’s winner Foresa Morada (wife of an OFW in Saudi Arabia), who was part of the audience, could of course relate to Russel’s emotions. Indeed, the OFW & Family Summit was not only a success in terms of turnout, it is an even bigger success because it makes a difference in the lives of our dear OFWs—they learn, they get inspired and they win. The third one next year will surely be another summit to remember!